This non-slip pad has multiple uses and can serve as an auspicious mat upon which to place offering bowls on one's shrine, or even as a mat for smaller statues, stupas, table top prayer wheels, or other consecrated objects. 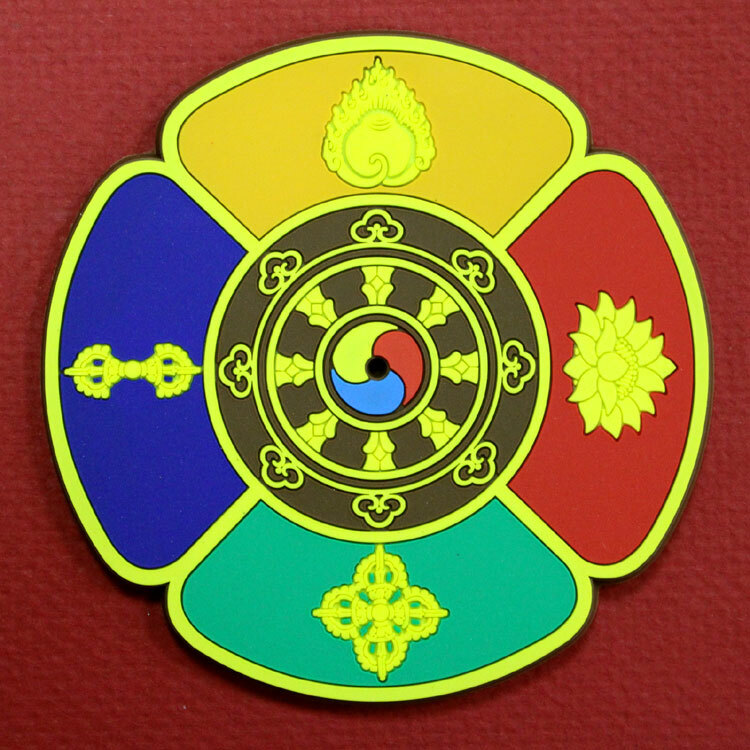 The design of the pad represents a basic mandala of the five buddha families. The blue quadrant in the eastern direction holds the vajra symbol of Buddha Akshobhya representing the mirror-like wisdom. 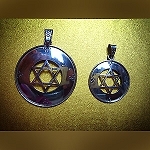 Next is the yellow quadrant in the southern direction with the jewel symbol of Buddha Ratnasambhava representing the the wisdom of equanimity. 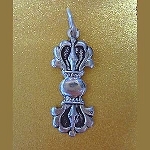 Following is Amitabha, buddha of the padma family, who is red and represents discriminating-awareness wisdom. Next is the quadrant of Buddha Amoghasiddhi, green in color displaying the vishvavajra (double dorje) representing all-accomplishing wisdom. 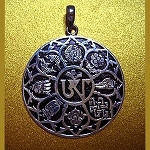 The center of the mandala represents Buddha Vairochana and features his symbolic attribute, the Dharma Wheel, the points of which incorporate auspicious cloud motifs. 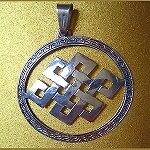 The tri-colored center motif symbolizes the three jewels (Buddha, Dharma, and Sangha).